Tourism Himalaya representative will receive you from Jammu Airport or Railway Station with warm welcome. Then you will be transferred to your hotel booked at Katra. Spend rest of the day at leisure. Proceed to Vaishno Devi Ji Darshan. You will have to ride high hills to visit the shrine. After Darshan, return back to Katra and check-in at hotel. Spend rest of the day at leisure relaxing at hotel. 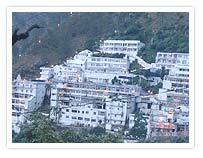 We can also arrange, visit to Vaishno Devi by Helicopter. Have your breakfast at the hotel. Then you will be transferred to Jammu for local sightseeing. After lunch you will be transferred to Jammu Airport or Railway station for onward journey.